When Rosa Parks died in October 2005, she became the first woman and second African American to lie in honor at the nation’s capital. Yet much of the memorialization reduced her historical contribution to a single act on a bus on a long-ago December evening. In this revealing and comprehensive biography-the first critical treatment of Parks’s life-historian Jeanne Theoharis shows that the standard portrayal of Rosa Parks as a quiet and demure accidental actor is far from true. Presenting a powerful corrective to the popular iconography of Rosa Parks as the quiet seamstress who with a single act birthed the modern civil rights movement, Theoharis excavates Parks’s political philosophy and six decades of political work to reveal a woman whose existence demonstrated-in her own words-a “life history of being rebellious.” From her family’s support of Marcus Garvey to her service with the NAACP in Alabama in the 1940s and 1950s, and from her courageous bus arrest and steadfast efforts on behalf of the Montgomery bus boycott to her work in Detroit challenging Northern racial inequality on behalf of a newly elected Congressman John Conyers and alongside Black Power advocates, Parks’s contributions to the civil rights movement go far beyond a single day. Even as economic hardship and constant death threats exacted a steep toll on Rosa and her husband, Raymond, she remained committed to exposing and eradicating racial inequality in jobs, schools, public services, and the criminal justice system. 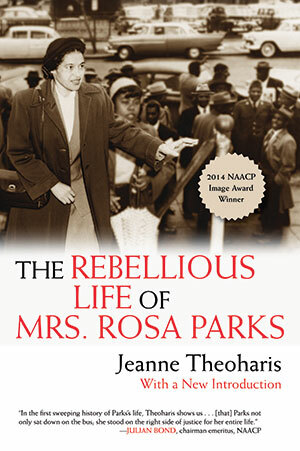 In The Rebellious Life of Mrs. Rosa Parks, Theoharis masterfully details the political depth of a national heroine who dedicated her life to fighting American inequality and, in the process, resurrects an inspiring civil rights movement radical who has been hidden in plain sight far too long. Parks’ body was first flown to Montgomery for a public viewing and service attended by various dignitaries, including Condoleezza Rice who affirmed that ““without Mrs. Parks, I probably would not be standing here today as Secretary of State.”“ Then her body was flown to Washington DC, on a plane commanded by Lou Freeman, one of the first African American chief pilots for a commercial airline. The plane circled Montgomery twice in honor of Parks, with Freeman singing “We Shall Overcome” over the loudspeaker. “There wasn’t a dry eye in the plane,” recalled Parks’ longtime friend, Federal Sixth Circuit Judge, Damon Keith. Her coffin was met in Washington DC by the National Guard and accompanied to its place of honor at the Capitol Rotunda. Forty thousand Americans came to the Capitol to bear witness to her passing. President and Mrs. Bush laid a wreath on her unadorned, cherry-wood coffin. “The Capitol Rotunda is one of America’ s most powerful illustrations of the values of freedom and equality upon which our republic was founded,” Senate Majority Leader Bill Frist (R-TN), resolution co-sponsor, explained to reporters, “and allowing Mrs. Parks to lie in honor here is a testament to the impact of her life on both our nation’ s history and future.” Yet, Frist claimed Parks’ stand was “not an intentional attempt to change a nation, but a singular act aimed at restoring the dignity of the individual.” Her body was next taken to the Metropolitan African Methodist Episcopal Church for a public memorial to an overflowing crowd. Despite those powerful visions and labors, the woman who emerged in the public tribute bore only a fuzzy resemblance to Rosa Louise Parks. Described by the New York Times as the “accidental matriarch of the civil rights movement,” the Rosa Parks who surfaced in the deluge of public commentary was, in nearly every account, characterized as “quiet”“. “Humble,” “dignified” and “soft-spoken”, she was “not angry” and “never raised her voice.” Her public contribution as the “mother of the movement” was repeatedly defined by one solitary act on the bus on a long-ago December day. Held up as a national heroine but stripped of her lifelong history of activism and anger at American injustice, the Parks who emerged was a self-sacrificing mother figure for a nation who would use her death for a ritual of national redemption. In this story, the civil rights movement demonstrated the power and resiliency of American democracy. Birthed from the act of a simple Montgomery seamstress, a nonviolent struggle built by ordinary people had corrected the aberration of Southern racism without overthrowing the government or engaging in a bloody revolution. This narrative of national redemption entailed rewriting this history of the black freedom struggle along with Parks’ own rich political history --disregarding her and others’ work in Montgomery that had tilled the ground for decades for a mass movement to flower following her 1955 bus stand. It ignored her forty years of political work in Detroit after the boycott, as well as the substance of her political philosophy, a philosophy with commonalties to Malcolm X, Queen Mother Moore, and Ella Baker, as well as Martin Luther King. The 2005 memorial celebrated Parks the individual rather than a community coming together in struggle. Reduced to one act of conscience made obvious, the long history of activism that laid the groundwork for her decision, the immense risk of her bus stand, and her labors over the 382-day boycott went largely unheralded, the happy ending replayed over and over. Her sacrifice and lifetime of political service were largely backgrounded. Parks’ body also served as important function--brought from Detroit to Montgomery to Washington DC and then back to Detroit for everyone to witness. Her body became necessary for these public rites, a sort of public communion where Americans would visit her body and be sanctified. This personal moment with Parks’ body became not simply a private moment of grief and honor but also a public act of celebrating a nation who would celebrate her. Having her body on view in the Capitol honored Parks as a national dignitary while reminding mourners that their experience was sponsored by the federal government. Look how far the nation has come, the events tacitly announced, look at what a great nation we are. A woman who had been denied a seat on the bus fifty years earlier was now lying in the Capitol. Instead of using the opportunity to illuminate and address current social inequity, the public spectacle provided an opportunity for the nation to lay to rest a national heroine and its own history of racism. This fable --of an accidental midwife without a larger politics --has made Parks a household name, but trapped her in the elementary school curriculum, rendering her uninteresting to many young adults. The variety of struggles that Parks took part in, the ongoing nature of the campaign against racial injustice, the connections between Northern and Southern racism that she recognized and the variety of Northern and Southern movements in which she engaged, have been given short shrift in her iconization. Parks’ act was separated from a community of people who prepared the way for her action, expanded her stand into a movement, and continued with her in the struggle for justice in the decades subsequently. This limited view of Parks has extended to the historical scholarship as well. Despite the wealth of children’s books on Parks, Douglas Brinkley’ s pocket-sized biography Rosa Parks: A Life and Parks’ own young-adult-focused autobiography with Jim Haskins Rosa Parks: My Story are the only, more detailed treatments of her life and politics. [x] With scholarly treatments of Abraham Lincoln numbering over a hundred and Martin Luther King in the dozens, the lack of a scholarly monograph on Parks is notable. The trend among scholars in recent years has been to de-center Parks in the story of the early civil rights movement, focusing on the role of other activists in Montgomery; on other people like Claudette Colvin who had also refused to give up their seats; and on places other than Montgomery that helped give rise to the movement. While this has provided a much more substantive account of the boycott and the roots of the civil rights movement, Rosa Parks continues to be hidden in plain sight. If we follow the actual Rosa Parks--see her decades of community activism before the boycott; take notice of the determination, terror, and loneliness of her bus stand and her steadfast work during the year of the boycott; and see her political work continue for decades following the boycott’s end--we encounter a much diff erent “mother of the civil rights movement.” Th is book begins with the development of Parks’s self-respect and fierce determination as a young person, inculcated by her mother and grandparents; her schooling at Miss White’s Montgomery Industrial School for Girls; and her marriage to Raymond Parks, “the fi rst real activist I ever met.” It follows her decades of political work before the boycott, as she and a small cadre of activists pressed to document white brutality and legal malfeasance, challenge segregation, and increase black voter registration, fi nding little success but determined to press on. It demonstrates that her bus arrest was part of a much longer history of bus resistance in the city by a seasoned activist frustrated with the vehemence of white resistance and the lack of a unifi ed black movement who well understood the cost of such stands but “had been pushed as far as she could be pushed.” The community’s reaction that followed astonished her. And thus chapter 4 shows how a 382-day boycott resulted from collective community action, organization, and tenacity, as Parks and many other black Montgomerians worked to create and maintain the bus protest for more than a year. The second half of the book picks up Parks’s story aft er the boycott. It shows the enduring cost of her bus stand for her and her family, and the decade of death threats, red-baiting, economic insecurity, and health issues that followed her arrest. Forced to leave Montgomery for Detroit, her life in the North--”the promised land that wasn’t”--is a palpable reminder that racial inequality was a national plague, not a Southern malady. Parks’s activism did not end in the South nor did it stop with the passage of the Civil and Voting Rights acts. And so the last chapters of the book illustrate the interconnections between the civil rights and Black Power movements, North and South, as Parks joined new and old comrades to oppose Northern segregation, cultivate independent black political power, impart black history, challenge police brutality and government persecution, and oppose U.S. involvement in Vietnam. One of the greatest distortions of the Parks fable has been the ways it missed her lifetime of progressive politics, a resolute political sensibility that identified Malcolm X as her personal hero. The many strands of black protest and radicalism ran through her life. Parks’ grandfather had been a follower of Marcus Garvey. She’d gotten her political start as a newlywed with her husband Raymond (the first real activist I ever met’) as he worked to free the Scottsboro boys and spent a decade with E.D. Nixon helping transform Montgomery’s NAACP into a more activist chapter. She attended Highlander Folk School to figure out how to build a local movement for desegregation and helped maintain --not simply spark-- the 382-day Montgomery bus boycott. Forced to leave Montgomery for Detroit, she spent more than half of her life fighting racial injustice in the Jim Crow North. Parks’ longstanding political commitments to self defense, black history, criminal justice, independent black political power, and community empowerment intersected with key aspects of the Black Power movement, and she took part in numerous events in the late 1960s and 1970s. Indeed, the scope of Mrs. Parks’ political life embodies the breadth of the struggle for racial justice in America over the 20th century. Finding and hearing Rosa Parks has not been easy. The idea of the quiet’ Rosa Parks has obscured all that she had to say. While there are literally endless articles and interviews to find of her, most interviewers asked similar questions. They tended to see her without hearing her, without listening for the political sensibility of the real actor behind the idea of Rosa Parks. Mrs. Parks talked slowly and measuredly, and interviewers often missed what she was actually saying, impatiently plowing ahead with the story they wanted to tell. [xi] The history of the boycott, of what led up to it and what happened during it, has become the stuff of legend--and numerous mistakes and misimpressions have been canonized in the historical record, creating another set of blinders. Moreover, as her friends and colleagues make amply clear, Mrs. Parks never volunteered information that wasn’t directly asked for. She was a political activist and a Southern lady--both of which called for the judicious use of stories, the masking of unpleasant or unnecessary details, and the tendency to background the individual to put forth the interests of the group. Her political activism was born in the viciousness of 1930’s Jim Crow South and the anti-Communist hysteria that attended it-- and this would indelibly shape how she obscured her own political sensibility and activities. While maintaining her activism over decades, she remained circumspect about it. Finally, for the second half of her life, Rosa Parks yearned for privacy and found her fame hard to bear, yet she simultaneously believed in her responsibility to continue telling the story of the movement as a way to keep it going. Her ambivalence--wanting the history of black struggle to be preserved but disliking the spotlight-- meant she often sought to endure the interviews, rather than use them to tell a different story. Thus, identifying her frame of these events-- her philosophy and narrative voice-- has required listening around the margins of those interviews to excavate a more substantive account of what was happening and how she saw it. She chose her words with care, and so, particularly in the sections related to her bus stand and the boycott, I have stitched together many, many quotes from dozens of interviews so that we might hear her insights and understand the events as she saw them. Combing the black press and the archives for mentions of her activities, documents, letters, and quotes, I have also interviewed many of her friends, family, and political associates to round out this picture. Unfortunately, many of Parks’ personal effects --dresses, awards, sewing basket, and papers --have been caught in an extended legal dispute over her estate between the Rosa and Raymond Parks Institute, which she co-founded with Elaine Steele, and her family. This led a Michigan probate judge to give Guernsey’s Auction, a celebrity auction house in New York City, the responsibility of selling all of it, with the profits to be distributed between her Institute and family. Guernsey’s Auction has been attempting to sell the Rosa Parks Archive for five years, steadfastly unwilling to let any scholar make even a cursory examination. The auction house prepared an inventory of materials, a 64-page list and companion sampling of interesting documents--a task that would be unthinkable without a scholar to contextualize the significance of the documents if Parks was considered a serious political thinker like Thomas Jefferson or Martin Luther King. What I have endeavored here is to begin the task of going behind the icon of Rosa Parks to excavate and examine the scope of her political life. In the process, I have used her history to re-tell and reexamine the span of the black freedom struggle, and to critique the many mythologies that surround much of the popular history of the civil rights movement. Rosa Parks’ life is already employed to tell a story of the United States. And so what I do here is tell a different story--showing the much broader truths about race in America, the struggle for black freedom, and the nature of individual courage to be gained from a fuller accounting of her life, a “life history of being rebellious” as she put it. It is a story with far greater lessons on how we might work for social justice today. A word on naming. I refer to Rosa Parks throughout the book both as Parks and Mrs. Parks. Most people, even young schoolchildren, recognize Rosa Parks.’ Using Parks and Mrs. Parks -- less familiar ways of naming her--signal the need to look at her more carefully. I predominantly use Parks (despite the fact that this was what she and others called her husband) to follow the custom of scholarly biographies to refer to the subject by her last name. But I interchange this with Mrs. Parks, a form of address that whites routinely deprived many black women like Parks of, and the way many people who respected her referred to her. Using the honorific also adds a degree of formality to mark that she is not fully ours as a nation to appropriate. And through the title’s juxtaposition of “Mrs. Rosa Parks” and “rebellious” I hope to get at the complex and significant ways she moved through the world.